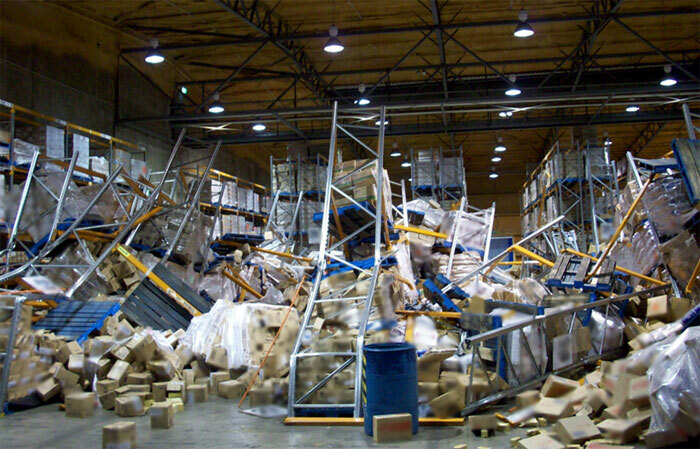 Blog Home > Pallet Rack > What Causes a Pallet Rack Collapse? How Can You Prevent it? 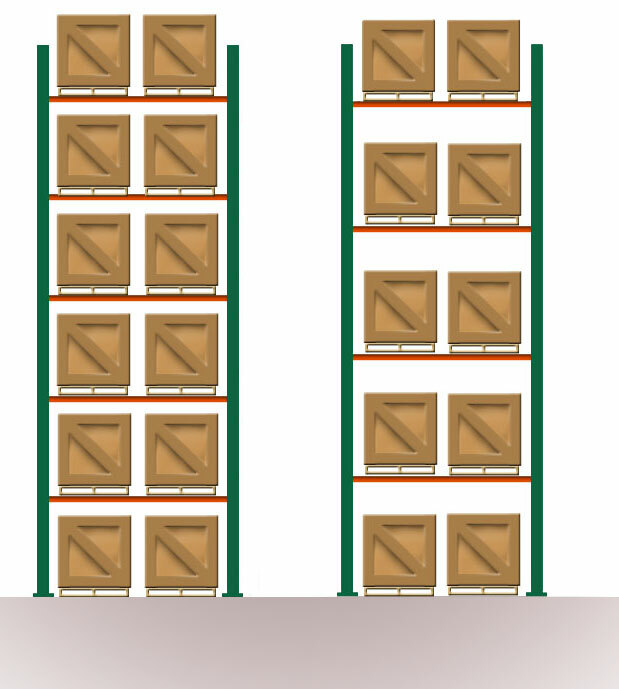 When heavy loads are stored on multi-level pallet racks, collapses and product falls are a primary safety concern. Busy warehouses with many workers who drive or walk between aisles of rack should find ways to reduce the chances of a disastrous event. Stopping a collapse is an order of magnitude easier and less expensive than a single incident. Due to its interconnected nature, when pallet rack falls, it’s usually an entire row, or a series of them. Costs, in terms of damaged product, lost production time, and injuries can be extreme. In many “just-in-time” manufacturing operations, losing components means losing days of production time. When racks are struck by a forklift, there is always a good chance of collapse, either at that moment or later due to structural damage or jostled loads. What are some steps you can take to reduce the chances of a collapse? Build in generous aisle space. While maximum space utilization is a key objective in any warehouse, safety comes first. 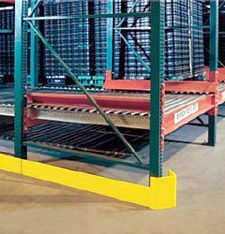 Many companies lay out their rack aisles with a “minimum” aisle provided by a forklift manufacturer for the lift trucks involved. The minimum may be too narrow, especially for inexperienced drivers. Aisle width should take pallet overhang into account on both sides of the aisle, as overhanging pallets are ubiquitous. It’s much harder to go back and reconfigure a rack system after the fact, so taking overhang, driver skills, traffic patterns, and throughput into account is critical on the front end. Aside from being safer, more generous aisles also increase productivity by allowing drivers to work faster in the aisles. See: A Guide to Forklift Aisle Widths. Install rack protection. This is an inexpensive and easy way to protect your racks. End frames and corner columns are the most vulnerable areas. All of the various types (bolted steel, floor-anchored, button-on, poly snap-on) can work. It’s a matter of what is best for your operation. You should always configure the protection to be effective at the point of most frequent damage. See: A Guide to Rack Protectors. Lay out adequate transfer aisles. Even when your picking aisles are clear, the transfer aisles can be an issue. Make certain that they are of sufficient width to support passing forklifts and pedestrians. If you utilize a rack tunnel (this typically leaves out a lower set of beams for a particular bay) for long runs or rack, mark the lowest remaining beam with hazard striping. Even better – use photoluminescent (glow in the dark) tape that may be more visible. Rack tunnels should always be wide enough for a forklift to drive and maneuver, with enough space for pedestrians as well. Another good idea is to install safety netting to catch falling items from the upper bays. Critical: make certain visibility is adequate in these tunnels. They are prime areas for forklift-forklift, or forklift-pedestrian collisions, so consider mirrors, additional lighting, or collision detection sensors to help reduce these issues. Say no to clutter. Cluttered aisles are difficult for forklift drivers. A drive whose floor space is compromised will have a greater chance of striking a rack. Keeping pallets, trash, receptacles, cartons or other obstacles clear is critical to warehouse safety. Inspect your racks: The only true way to understand that a rack has been damaged and requires replacement or repair is to inspect them frequently. Look for damage, bends, dents, scraped paint. These are all easy to see and can help you ensure that your rack isn’t at risk. See: A Guide to Rack Inspections. Enforce the speed limit for forklifts: Forklifts shouldn’t travel any faster than 8 miles per hour, and near pedestrians it should be no faster than 3 MPH. Lower speed operations should also apply to pallet rack areas. In aisles, near corners or within rack tunnels should be “slow-go” areas for forklifts. In particular, this should apply to dynamic, high-density racks like drive-in. For comprehensive information on this, see OSHA’s guidelines on Lift Truck Speeds. Beams are somewhat straightforward, assuming they are not damaged, have their safety clips, and have stable pallets loaded onto them. It’s important to note that beam capacity is by pair, not by each. Beam capacities also depend on an evenly distributed load, and also can change if you are using decking rather than placing a pallet flat on the beams themselves. You can also compromise beam loading with damaged pallets or particularly high-density loads. Always check these factors when you load your racks. See: Loading factors and beam capacities. Upright frame capacities are more complex. If you modify the space between beam levels, that can add to or reduce the upright frame capacity. We cover that extensively in this article – see: Calculating Upright Frame Capacities. Racks are designed for static loads, not impact, and one of the worst is from within the structure when a lift is loading or unloading. Tight clearances between the rack uprights and the pallets, or between the pallets themselves, sets your forklift driver up for failure and a possible rack collapse or falling pallet. Industry standards vary, so check your manufacturer’s specifications. Horizontal clearances: A very typical 96″ wide beam should provide good horizontal clearances and allow drivers to maneuver pallets without bumping the rack. Vertical clearances: are the bigger problem. You should have at least 6″ clearance between the top of your load and the bottom of the next beam level, but more doesn’t hurt. More generous vertical clearances should be built into upper beam levels, since loading/unloading those beams is more difficult for drivers. The ability to gauge distances declines the farther away the load, so adding more space for upper levels is a good idea if you have the space, and if the additional space clearance isn’t enough to substantially impact frame capacity. Consider this technology: These days, there are high-tech forklift-tine laser guides that help drivers see where they are loading more clearly. These systems project a laser-line of light to show where the tines are aligned. Almost any reputable rack company will help you understand what your rack is capable of: its beam capacity, its upright capacity, and how those capacities can change due to spacing or loading factors. When you choose used racking or change the load profile on existing racks, be double-sure that it meets your specifications. Many companies like used rack because it’s less expensive. Some even re-use the existing rack left over from a previous operation, after moving into a new facility. There is nothing wrong with that, so long as you understand exactly what the rack is capable of. Best to identify it, check manufacturer specifications, and be sure your storage application works for that particular rack, configured in a particular way. If you aren’t sure, consult us or another racking company with real expertise in understanding these issues. Anchor the rack: Anchors play a role by fixing the relative distances between columns. Racks cannot be trusted to hold their listed capacity when they aren’t bolted to the floor. Anchors provide resistance to horizontal displacement and can help increase stability. Every rack should have them. This mistake is one of the easiest to rectify. You should consult your rack provider for information on what is considered a normal anchor. It’s typically included with installation manuals/drawings for new racks, and those are available online for many rack brands as well. This is usually a 1/2″ diameter anchor with a proper depth, assuming a non-seismic application. Check for safety clips/locks: These locks are generally installed on teardrop beams. They help prevent beams from accidentally dislodging (this usually happens due to loading errors). Look for damaged or missing ones when you inspect your rack. What Causes a Rack Collapse?